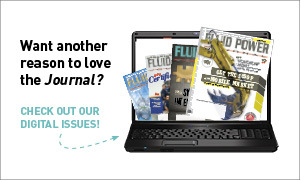 For over 23 years the Fluid Power Journal has been the resource for certified fluid power professionals promoting education, personal development, and reporting on the latest news and developments within fluid power. As the official publication of the International Fluid Power Society, we strive to increase awareness regarding hydraulic, pneumatic, vacuum and motion control products and innovations to enhance the image of the fluid power industry. From career development articles to directory issues that cover various segments of the industry, our magazine focuses on displaying the spectrum of professionals, engineers and technicians that work with fluid power daily to the companies that manufacture and distribute fluid power products. Moreover, we at the Journal have an open forum to encourage discussion on issues and developments that affect our industry. With 6 bi-monthly issues a year and 4 industry resource directories, information on manufacturer’s and distributors and their product categories is at your fingertips either in print and online. Lastly, with certification and continuing education an important part of the industry, schedules of the latest training classes, seminars and trade shows are posted every issue.